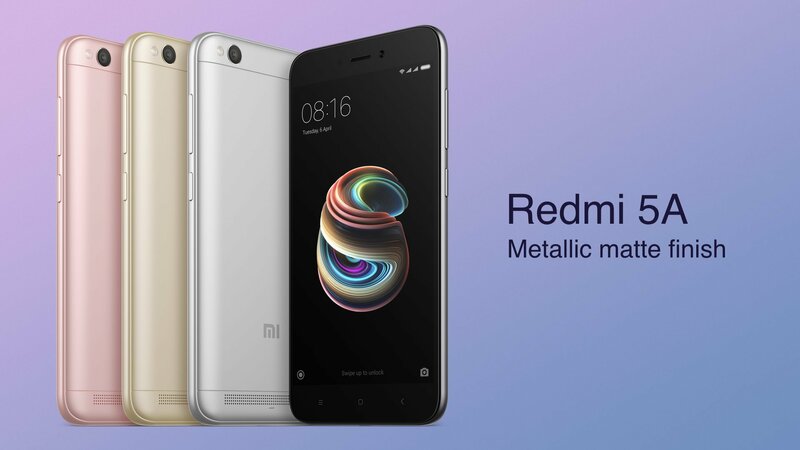 Xiaomi promoted its upcoming device as ‘Desh Ka Smartphone’ or ‘Country’s Smartphone’ and today, the company launched Xiaomi Redmi 5A in India and as all other phones by Xiaomi, the Redmi 5A has been priced aggressively, and the price starts at Rs. 4,999. There is almost no difference in the design of the phone if you compare it with the Redmi 4A and some of the specifications are also the same. So, what makes the phone different from its predecessor? Let’s talk about the specifications in detail. It’s a normal looking budget smartphone with an HD display and a screen size of 5-inch. The resolution is 1280×720. The phone is powered by the Snapdragon 425 processor, which is a quad-core chip clocked at 1.4GHz. There is also Adreno 308GPU. There are two different variants of the phone – 2GB RAM + 16GB ROM & 3GB RAM + 32GB ROM. It is good to know that there is no hybrid SIM slot and the Xiaomi Redmi 5A comes with a dedicated microSD card slot. Under the hood, the phone runs on Android 7.1.2 Nougat with MiUI 9 on top. A 3,000mAh battery is there which seems big enough to last a full day. On the rear, there is a 13MP camera with a f/2.2 aperture, and a 5MP sensor is present on the front with a f/2.0 aperture. Just like the Redmi 4A, there is no fingerprint scanner present on the 5A, but there is the Infrared sensor that we see on every Xiaomi device. 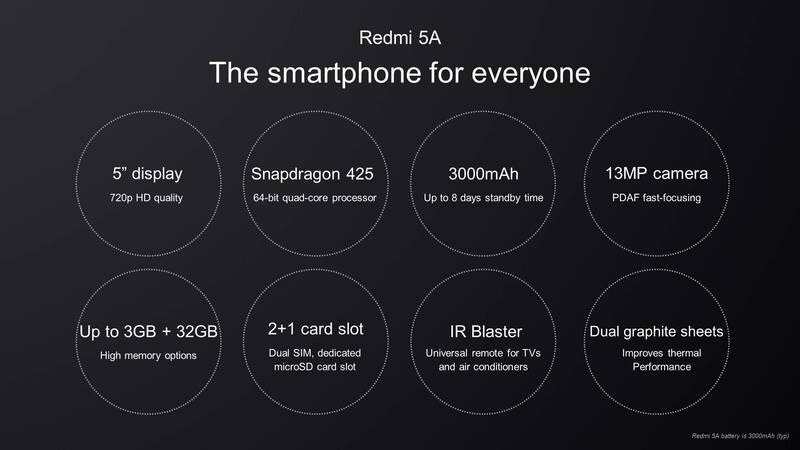 Now, it is weird to know that the Xiaomi Redmi 5A has same specifications as the Redmi 4A except for a few. 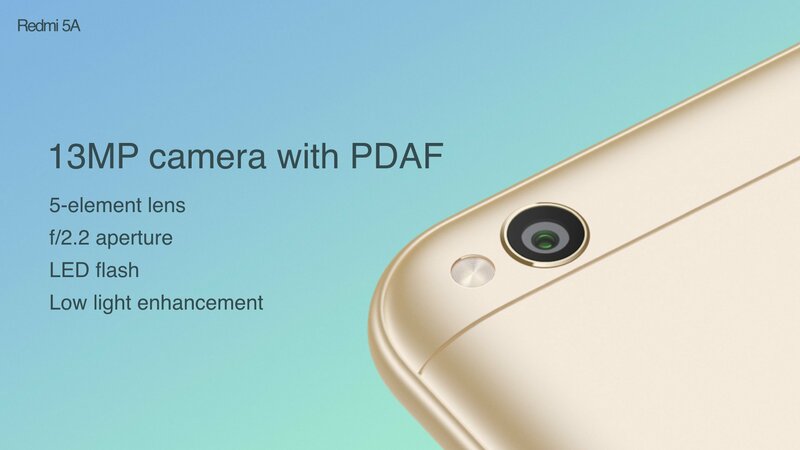 The phone has the same processor, RAM, screen, cameras (5A has f/2.0 aperture on the front, though), etc. Also, the battery is now smaller than the one present on the Redmi 4A. Talking about the differences, the phone has a dedicated slot for microSD card, a slightly different Antenna line design on the rear and lower price of 2GB RAM model ( that too, for first 5 million units). The 2GB RAM model is priced at Rs. 4,999 whereas the 3GB model at Rs. 6,999. After the first 5 Million units, the 2GB RAM variant is going to be priced at Rs.5,999, i.e., same as the pricing of Redmi 4A with 2GB RAM. So, it seems you are getting the same Redmi 4A with a new name & a little design change. What are your views on this new phone by Xiaomi? Do let us know via the comments section.